I put up the Christmas tree, a modest Frazier Fir with good shape, a few days ago and we were in no hurry to do any decorating of the tree that night. After waking up the next day I began to walk down the hallway and here was this little green guy (girl perhaps) just in front of me on the carpet. I wasn't quite certain how to care for this tree toad, but I wasn't ready to put him back into the wild just yet. Pete (our company mascot, the 3rd Toad) seemed domesticated (somewhat) since the first day I met him. He's always taken care of his basic needs and I have no idea where Pete gets his insects, but he doesn't seem to be anywhere near starving. In fact, he could afford to lose a few milligrams. Well, Pete's down in the Caribbean on some tennis trip, so I had to count on the Internet to get the information I needed. In the meantime, our new guest decided to leap off to somewhere in the house, not to be easily found. I did put out some distilled water for him, but insects are hard to come by this time of year and obviously the pest control man has been doing a good job. 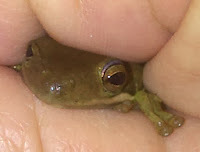 Well, he or she still seemed healthy, but not quite the talker (croaker), so if I was going to find it again, he or she was going to have to make it quite obvious. During this time the Christmas Toad got a name - Noel. Okay, this works whether it's male or female. We'll go with male just for the sake of consistency. 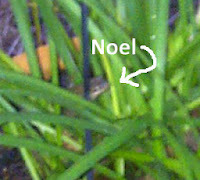 I didn't see Noel for the entire day and wondered if his time had expired or if he was simply hiding. Perhaps he went back to the tree. I went into the kitchen the next morning and there he was, right in the center of the floor. This is the first time I attempted to catch him and he leapt about two feet on to a cabinet door. I decided it was time for him to get back to his real world so that he could eat his usual diet and climb whatever he so desired. Besides, there is only room for one toad around here when you have the ego of Pete trying to rule the place. Noel wasn't extremely thrilled about the idea of me picking him up so I had to give chase, but soon Noel was in hand. I took him out to the deck and placed him on the railing and he immediately jumped into a larger potted plant. 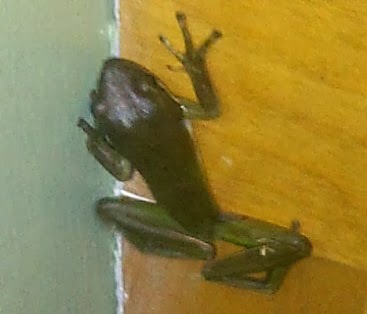 By the time I came back with a cup of coffee he was gone - off to do what wild tree frogs do. All too well, do I know what the tennis loving celebrity type toads do. It was kind of nice having a normal, well-adjust toad around for a few days. Hoping if there was something in your tree when you brought it home, it was a nice thing.